Mindfulness is a paradox that we all can embrace fully, living mindfully in its depth of meaning. When we see the paradox in mindfulness, we can use it to live our lives in such a way that we create wellbeing both now and in the future. It can’t be both the best of times and the worst of times; it can’t be at once the winter of despair and the spring of hope. But, in the reality of our lives, these opposite extremes can and do occur together. In our times of deepest despair, we often experience hope. It’s that very hope, even if it’s just a faintly glowing ember, that we build on to rise out of despair. Despair and hope very much occur together. Mindfulness is a single concept with depth of meaning that builds hope and leads us (or walks beside us) out of despair. Living mindfully gives us calm, steady control over the life we want to live. Understanding and embracing the paradox of mindfulness strengthens us and the quality of life we are creating. 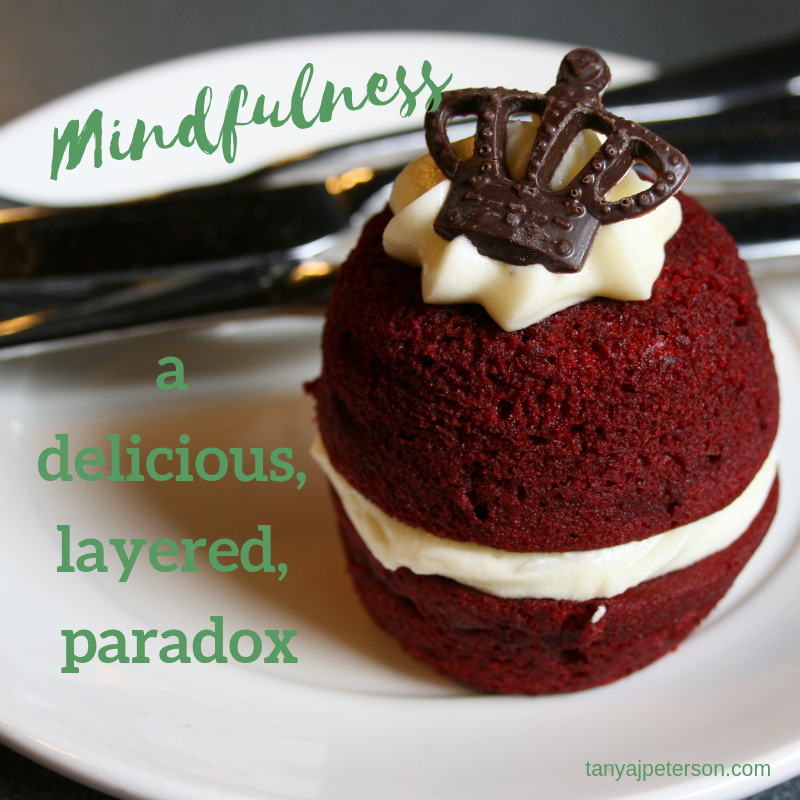 Mindfulness is layered like a delicious cake. (If you’re not a cake eater, simply substitute something you like.) The surface you see is the frosting, which offers a sweet experience. But there’s more! Underneath the frosting are layers of moist cake and more frosting. The experience just keeps getting better because there’s so much to it. Mindfulness is like that layered cake. On its surface, mindfulness is a tool for wellbeing. Go deeper, and it becomes not merely a tool to use but a way to live well now and in the future. Here in lies a paradox. 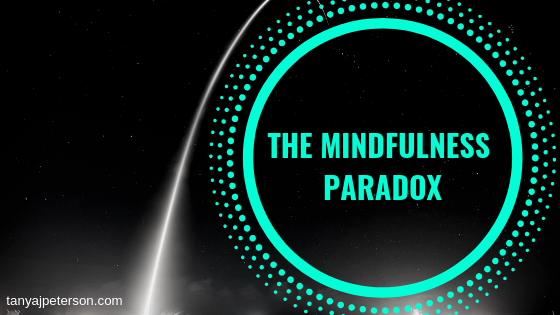 Mindfulness is not just one but three paradoxes. If you can avoid being mind-full, it’s the secret to being mindful. Its name is a bit of a paradox. The idea of mindfulness is to pull yourself out of the cluttered thoughts and emotions of your mind and into the present moment. Essentially, with your focus on what you are seeing, hearing, feeling, smelling, and doing right now, in this moment, your have a mind that is not full of chaos. It’s simple yet complex. Essentially, mindfulness means staying grounded in the present moment, all senses honed in to the here-and-now with your attention, focus, and enjoyment following. Simple. But that’ just the frosting. Underneath, there’s a lot going on. It’s difficult to learn the art of mindfulness, and we often get in our own way. To learn how to simply be, we need to read tips and information, and we need to practice over and over again. Staying in the present, even thought that’s where our bodies are, doesn’t come naturally. Its meaning and impact extend beyond the present. Mindfulness gets us out of our head so we can live fully right now. It drags us (gently) out of the past so we can be completely in the present. Mindfulness reduces worries and what-ifs about the future so we can enjoy our lives and loved ones. It’s all about our present moment and creating our quality life now. That said, mindfulness is also about our creating the future as we want it. In living completely, fully in our present, we create a solid path to a vast future of calm, joy, mental health, and wellbeing. Life is a preparation for the future, and the best preparation for the future is to live as there were none. Perhaps unwittingly, Einstein captured the heart of mindfulness. We need to be here, right now, living our lives and doing wat is necessary to create our reality and make it good. Life is now. The future is later. But we build on the present to create a future we live for. Mindfulness is a piece of cake. And with mindfulness, you can have your cake and eat it, too.